A hearty soup with a backbone of warming spice. You could swap the cannellini beans for butter beans, or use a mixture of the two. 1. Heat 2 tsp olive oil in a large deep pan set over a medium-high heat. Add the onion, carrot and celery and sweat for 12 minutes, stirring every now and again, until soft and slightly golden. 2. Add the garlic, tomato purée and curry powder to the pan and stir for 1 minute. Set a handful (about 75g) of the beans aside to garnish, then add the rest to the pan with the lentils and stock. Bring to the boil, then simmer with the lid a jar for 20 minutes, until the lentils are soft. Blend the soup to a smooth consistency and season to taste. 3. In a small bowl, mix the reserved cannellini beans with the remaining 1 tsp olive oil, the chopped parsley and a small pinch of crushed sea salt. 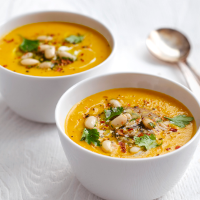 Ladle the soup into bowls and top with the reserved beans and a sprinkling of chilli flakes. A dollop of natural yogurt makes a good topping, too, if liked.